Menulog delivers for California Burgers so you'll be able to track your courier on a map. The Altman Burger - New From California! Designed by The Altman Brothers. Two smashed patties, two American cheese, bacon, pineapple, lettuce, tomato, a ring of raw onion, pickles and housemade pink mayonnaise served on a fresh, brioche bun. The Jai-Gantic Burger - New From California! Designed by Michael Jai White. Bunless burger, two turkey patties, two American cheese, tomato and grilled onion with Dijon mustard and ketchup wrapped in hand leafed lettuce. Three fresh hot jam donuts rolled in sugar. Designed by UFC Champion Georges St-Pierre. Two beef patties, two slices of American cheese, a slice of bacon, grilled onions, lettuce, tomato, pickles, pink mayonnaise, relish and honey mustard on a brioche bun. Freshly smashed beef patty, a slice of American cheese, bacon, onion rings, lettuce, tomato, onion, pickles, pink mayonnaise and ketchup. The OC Bacon Burger - New From California! Fried Dim Sims - New From California! Potato Cakes - New From California! 5 pieces. Classic churros made fresh to order and dusted with powdered sugar. 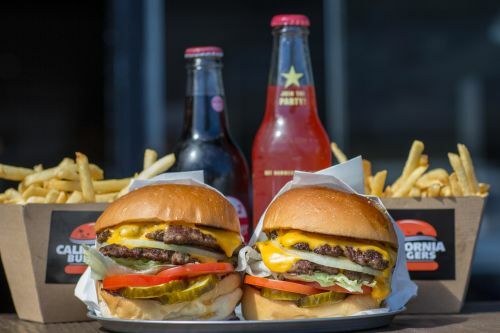 Choose one of our top selling burgers, shoestring fries and drink! Six grilled chicken thighs and large fries and a drink. Two burgers, two shoestring fries and two drinks. Fresh BBQ grilled chicken ribs with fries. Two smashed beef patties, two slices of American cheese, bacon, pineapple, lettuce, tomato, a ring of raw onion, pickles and housemade pink mayonnaise served on a fresh, brioche bun. California Animal - special grilled and infused mustard beef patty and extra grilled onion. Freshly smashed beef patty, a slice of American cheese, lettuce, tomato, onion, pickles, pink mayo and ketchup. Two fresh beef patties, two slices of American cheese, lettuce, tomato, onion, pickles and pink mayonnaise. Fried chicken breast, American cheese, lettuce, tomato, onion, BBQ and hot sauce. Two freshly smashed beef patties, three slices of American cheese, grilled onion and ketchup. Fresh Turkey patty, American cheese, lettuce, tomato, onion, pickles and pink mayonnaise. Freshly smashed beef patty, American cheese, lettuce, tomato, onion, pickles, pineapple and pink mayonnaise. Freshly smashed beef patty, American cheese, lettuce, tomato, onion, jalapenos, pickles, homemade vatos locos hot sauce and pink mayonnaise. Four fresh beef patties, four slices of American cheese, lettuce, tomato, onion, pickles and pink mayonnaise. Bunless burger. Two freshly smashed beef patties, two slices of American cheese, lettuce, tomato, onion, pickles and pink mayonnaise wrapped in fresh hand leafed lettuce. Grilled saganaki patty, lettuce, tomato, raw onion and pickles with pink mayonnaise and ketchup. Two freshly smashed beef patties, two slices of American cheese, a slice of bacon, grilled onions, lettuce, tomato, pickles, pink mayonnaise, relish and honey mustard on a brioche bun. Six grilled chicken thighs served on large fries. American cheesy fries loaded with your choice of favorite toppings. Small. Do you just love pickles? Order a side of pickles. Order a side of jalapenos. Delicious! Glass bottle imported from California. Five pieces. Classic churros made fresh to order and dusted with powdered sugar.